The Samsung Galaxy Ace 2 I8160 measures 118.3 x 62.2 x 10.5 mm and weighs 122g. That's a bit bigger - but slimmer - than the original Ace and a little more compact than a Galaxy S.
We didn't get the retail box of the Galaxy Ace 2, but we were given all the accessories. There are no surprises here, just a compact microUSB charger, a microUSB cable and a headset with an unusual design and a single button remote. The Samsung Galaxy Ace 2 resembles a compact Galaxy S, which helps brand identity (the original Ace looked a lot like a certain very popular competitor). The phone remains relatively compact, despite the increase in screen size. Speaking of the screen, it's a very good unit and a major improvement over what Galaxy Ace owners are used to. It's a PLS LCD unit with a 3.8" diagonal. The resolution has been more than doubled and is now WVGA (480 x 800) at 246ppi pixel density. The image looks sharp, with very good viewing angles and pleasant colors. The brightness could've been better though (we'll measure it when we get a retail unit) and the screen is rather reflective, meaning sunlight legibility is less than stellar. Above the display, there is the proximity sensor, but no ambient light sensor. There's a new addition here too - a front-facing VGA camera. Below the display there's an arrangement of three keys, typical for Samsung. The hardware home key is central, with two capacitive buttons on either side - Menu and Back. On the left side of the Samsung Galaxy Ace 2 I8160 there's the lanyard eyelet, the volume rocker and the microSD card slot, under a plastic flap. The card slot accepts cards of up to 32GB, so you can have plenty of storage even when the built-in 4GB run out. The Power/Lock key is on the right (as it is on many Samsung phones), which makes it accessible with both the right-hand thumb or the left-hand index finger, depending on which hand you're holding it with. Some users would still rather have this button at the top though. On the top side of the phone is the 3.5mm standard audio jack, as well as the small crevice for removing the back panel. The bottom of the phone features the USB port and the mic pinhole. The microUSB port is used for both data and charging. The back of the Samsung Galaxy Ace 2 is almost completely flat with a very subtle diamond pattern. The plastic is good and takes almost no fingerprints, but lacks any sort of premium feel to it. The back also features the loudspeaker grille, which has a small nub against getting the sound muffled when you place the phone down on a level surface. Underneath the battery cover is the SIM card slot and the battery. The battery is a 1500mAh unit, but Samsung haven't quoted any battery life numbers. We'll do our own tests when we review a market-ready unit. 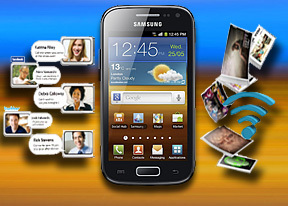 The Samsung Galaxy Ace 2 I8160 is solidly built and since it has no chin or hump, the phone slides into pockets easily. The Ace 2 is a bit on the wide side at 62.2mm but it's quite comfortable to hold. We have no gripes with the handling and usability of the phone, the one complaint we do have is the phone's plain plasticky aesthetics. This concludes the hardware part and we're ready to move on to software. With Android 2.3 and TouchWiz 4.0 we don't expect any surprises there. Value for money phones like the Ace 2 aren't supposed to surprise, as long as the functionality is up to scratch.